President Donald Trump arrived in Westhampton Friday afternoon en route to a fundraising luncheon in Southampton. Air Force One was scheduled for an 11:50 a.m. arrival at Francis S. Gabreski Airport and touched down around noon. 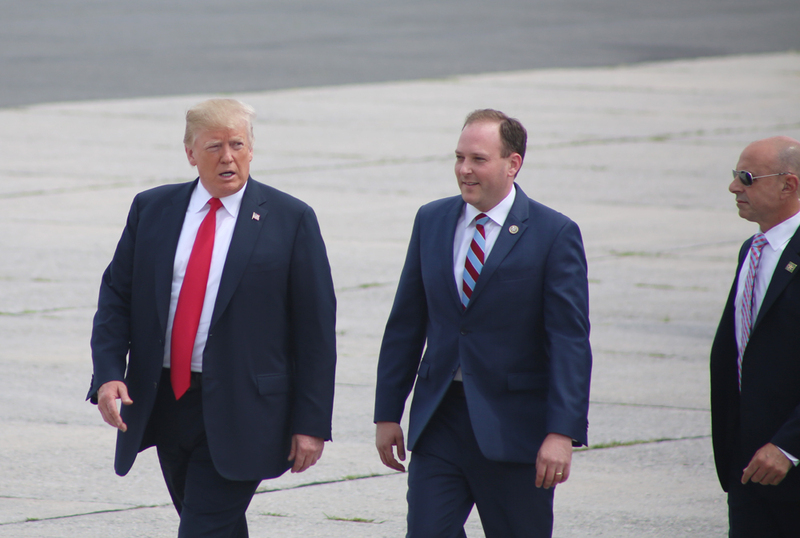 Local officials including Congressman Lee Zeldin (R-Shirley) and Westhampton Beach Mayor Maria Moore greeted Mr. Trump as he stepped off the airplane. They were also joined by John Raguso, whose son Master Sgt. Christopher Raguso died in a helicopter crash in Iraq in March, Doon Gibbs, Director of Brookhaven National Lab, and Rocky Point teenager Quentin Palifka. A crowd of supporters from the 106th Rescue Wing, which is stationed at Gabreski, gathered near the tarmac for the president’s arrival. After shaking hands and stopping for pictures with some of the crowd, Mr. Trump got into his limousine and escorted by motorcade to Southampton Village. A group of protestors was also gathered across from Gabreski Airport. Roadways from the airport to Southampton were closed from around 10:30 a.m. Friday morning and the Federal Aviation Administration issued a temporary restriction for planes flying below 18,000 feet in the Hamptons that will expire around 3 p.m. According to Blair Ellis, a spokeswoman for the Republican National Committee, Mr. Trump is set to attend a fundraising luncheon with RNC Chairwoman Ronna McDaniel in support of the Trump victory Committee. Approximately 60 guests are expected to attend, raising about $3 million to benefit both the RNC and Mr. Trump’s 2020 campaign, she said. The White House did not release further details on his visit to the East End. On Tuesday, Bloomberg reported that the fundraiser would be held at the home of Manhattan developer Howard Lorber, the executive chairman of Nathan’s Famous Inc. and chief executive officer of the Vector Group, a parent company of Douglas Elliman Realty. Mr. Lorber served as an economic adviser to his 2016 campaign. Katie Vincentz, communications director for Mr. Zeldin, said the congressman would be traveling with Mr. Trump to the fundraiser. This marks Mr. Trump’s first visit to the East End as president. He hit the campaign trail in Southampton and Patchogue in 2016 and returned to western Suffolk County twice in less than a year to discuss MS-13 as president. Perry Gershon, the Democrat who will face Mr. Zeldin, a Republican, in November’s election for the 1st Congressional District, criticized the fundraiser.